Want to feel rejuvenated every day?Invigorate your mornings with the refreshing fragrance of LUX Fresh Splash beauty bar, a sparkling combination of fragrant water lilies and cooling mint that will turn your shower into a moment of indulgence. At first lather, your senses will be gently awakened by the cooling freshness of mint, one of nature’s vital mood lifters, followed by the soothing and rejuvenating scent of water lilies. Together, they refresh and energize you to take on any challenge for the day. A sensational body soap, LUX Fresh Splash blends rich, luxurious lather with expertly crafted fine fragrance. It is the best soap bar that gently cleanses your skin to leave it icy cool, silky smooth and subtly perfumed with a fresh and pampered feeling all day long.With LUX Fresh Splash, you can incorporate fragrance into your morning shower regime or indulge in its revitalizing perfume for an evening wind-down. LUX Fresh Splash beauty bar is the perfumed soap bar that brings out your extraordinary every day, with every shower. LUX body wash and beauty bar fragrances are crafted by the world’s best perfumers to transform your daily shower into an indulgent experience that will make you feel energized and special every day. Explore the entire range of Soaps available on Nykaa. 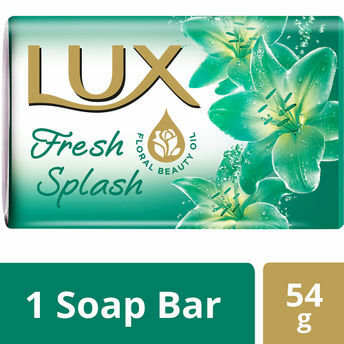 Shop more Lux products here.You can browse through the complete world of Lux Soaps .Alternatively, you can also find many more products from the Lux Fresh Splash Soap Bar range.